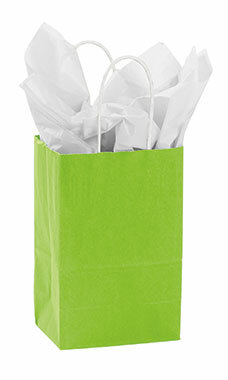 The Small Lime Green Paper Shopping bags are the perfect retail bag for small trinkets, jewelry and other items! Featuring a vibrant lime green exterior coloring with white interior and twisted handles, these durable shopping bags are perfect for any retail store! Add tissue and ribbon and you have an instant gift bag for your customers! Sold in a case of 100 bags.